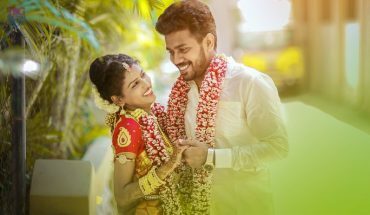 The dreamy wedding story of the chirpy and enterprising bride Anu George Canjanathoppil to Sachin Louis on the 24th of October 2016 in Bangalore, revives our dreams of the perfect fairytale that springs from an arranged marriage. Then follows the cinematic account of the couple’s first meeting. Anu had gone home to Kerala to celebrate Onam with her family and was surprised by the arrival of her relatives. A period of courtship followed, too soon end in the positive answer that both families were waiting for. 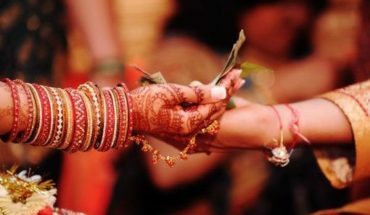 So now that the couple could imagine spending their lives together in bliss, the wedding arrangements went ahead in full swing. “What really worried me while planning my wedding was the fact that it was happening far away from where I stayed, so normally challenging wedding planning to become twice as hard. Thanks to my past experience in event management, I had a fairly good idea of all the things that had to be done, and so the mammoth tasks didn’t overwhelm me,” she says. A surprising fact is that Anu was in the U.S. for work till nine days before her wedding, and there was very little time for her to shop for jewelry (which she picked out in hardly fifteen minutes while shopping with her mother) or decorate the church (which had a funeral service only half an hour before the wedding was scheduled). Despite all these time constraints, Anu managed to participate in planning her own wedding, and not just arrive in time to walk down the aisle. “My friends and I decorated the church ourselves with rented-out metal buckets filled with baby’s breath flower buds. The night before the wedding, my family and I sat up tying ribbons on the buckets. We also filled plain water glasses with twigs and tiny tea lights for the centrepieces. It was so much fun! I wouldn’t have had it any other way,” she smiles. And here’s something to give us major wedding outfit goals. This super creative woman actually designed her own wedding sari. 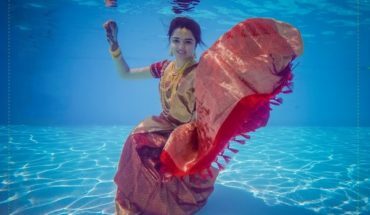 From shopping for the material, designing it, and getting it tailored, Anu George was in charge of creating her own wedding sari. ‘I really didn’t want to wear something right off the shelves that had no special meaning to me,’ she says. When it came to the challenges of wedding planning, Anu George confesses that she was a very ‘chilled-out-bride’. Of course, every step was a challenge, and different things demanded her attention at different stages. But Anu had love and support every step of the way. ‘Sachin’s family was very supportive. The whole wedding was organised in partnership with them. And Sachin was one in a million, as I mentioned earlier because he understood the value of my job and knew how much a part of me it was, to move to Delhi after marriage. And my family and friends were there for me throughout. Even friends who flew in from all parts of the world worked in collaboration with each other prior to their arrival, and one of my closest friends who couldn’t be there for the wedding kept sending pictures of ideas for decorations and outfits,’ says Anu. So this is the story of Anu & Sachin. Do you like this story? Tell us your views about Anu & Sachin’s simplicity in the comment section.